Develop ideas & get answers to help make decisions and act. Spark Chart is an ideal enterprise survey software tool for large organizations. Spark Chart helps you rapidly gather and share information with leaders, teams, employees, clients and stakeholders. Conduct surveys to get insights, answers and ideas and make decisions. Design and run any type of survey with Spark Chart. Use Spark Chart for strategy, vision and business plans, employee surveys, to analyse customer needs, assess competitors, find out what leaders think or build teamwork. Perhaps you need to brainstorm ideas, perform a SWOT Analysis, gather information or assess performance. Create and manage Spark Chart accounts for individual departments. You can assign unlimited users to each department account or across multiple department accounts. Conduct unlimited surveys with unlimited questions and unlimited responses in each department account. Customize the branding, including logo, colours and email accounts for survey distribution. Free access to high quality survey templates for most survey purposes. These surveys can be customized easily. Easily copy surveys, email templates and projects to client accounts. Create presentations and add key messages and recommendations directly into Spark Chart. No need to export results. Customize presentations for different groups and share your results easily and instantly. Take advantage of our survey training programs and survey consulting services and learn how to manage survey projects or how to design surveys. Sign up for an Enterprise Plan with no set-up fees. Learn how easy it is to use Spark Chart with our support. Start running projects for a small fee per month. 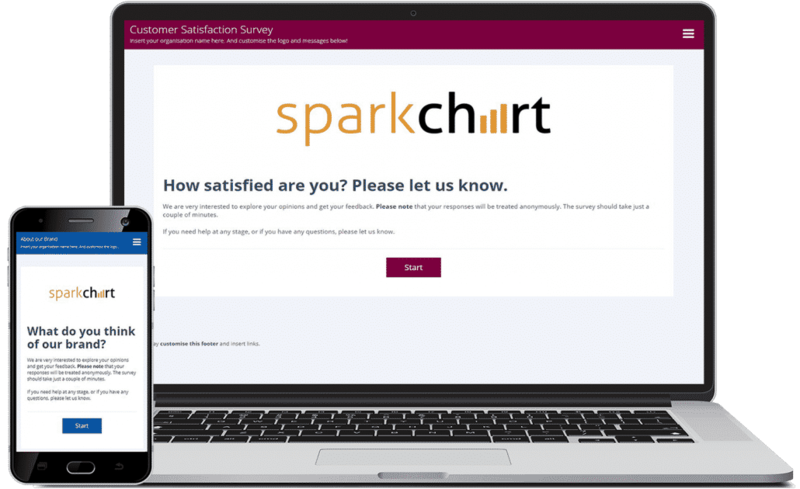 Take Spark Chart survey software for a spin with a free trial.